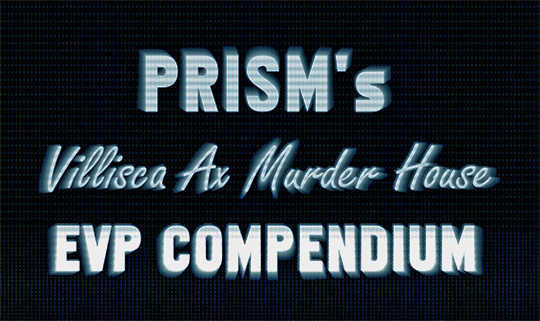 PRISM has been investigating the Villisca Ax Murder House in Villisca, Iowa since 2005. This page is an effort to catalog the best Electronic Voice Phenomena (EVP) audio that has been recorded at the house, not only by our team, but by other paranormal teams and both amateur and professional paranormal investigators. We would like to thank everyone who has contributed to this project. To contribute an EVP of your own, please contact us here. Note: This page was created on December 15, 2014 and is a work in proogress. More EVPs will be added to this compendium at a regular interval. Please check back! Villisca Ax Murder House on June 1, 2005. Over a 10 year span, PRISM has recorded many Class A EVP of children sounds that we believe to be the the deceased Moore and Stillinger kids. The same spirit/ghost voices of these children have been recorded by other paranormal teams, on different recording sources, and on different dates. Great EVP audio comparisons from ORBS, Smoky Valley Paranormal, and Rachel M. Jones, confirm that we are all recording the same children! If we are all recording the same children's voices, it must be proof that the dead can speak. This audio clip was recorded at the Villisca Ax Murder House, Villisca, Iowa (June 2008) by Matthew Schulz of ParaXplorer Project. He left a digital audio recorder on record, on the arm of the couch in the parlor, while his team was taking a break from late night organized contact sessions. There were no children present either inside or outside the house. The EVP (Electronic Voice Phenomena) of a child's voice is in three sections lasting a total of 35 seconds. This audio clip was recorded in the kitchen of the Villisca Axe Murder House by PRISM investigator Dan Christianson on a Sony ICD-B300 digital audio recorder on May 27, 2006.